A little while after painting the view which I showed you yesterday I ventured to do a loose sketch of a couple of boats. These two guys were moored in a row and they overlapped each other nicely in both bodies as well as reflection. Somehow I immediately saw an elongated portrait format of them before my inner eye. So I started painting them in my sketchbook. I was perched perilously close to the water’s edge on my little folding stool which maybe accounts for the lack of finer detail. But then again, it was meant to be quite loose and it is. One more thing: Unbeknownst to me at the time of making this sketch, the green boat was to carry the entire family and guests over the lake and into the sunset (and back) later that day. I realised that as I was standing on the boat (kitsch alert!) with the wind blowing through my hair and the wild geese flying South into the subtle autumn sunset. Nachdem ich die Aussicht gemalt hatte, die ich gestern gepostet habe, wollte ich eine lockere Aquarellskizze von ein paar Booten malen. Diese beiden dicken Kerle lagen in einer Reihe da und haben sich so nett überlappt mit ihren Bootskörpern und Spiegelungen, dass ich sie vor meinem Auge sofort auf einem schmalen Hochformat malen wollte. Das habe ich dann auch gemacht. Ich saß mit meinem kleinen Angelhocker sehr nahe an der Wasserkante, was vielleicht das Fehlen von kleinen Einzelheiten erklärt. Aber es sollte ja ein lockerer Sketch sein, und das ist er auch geworden. 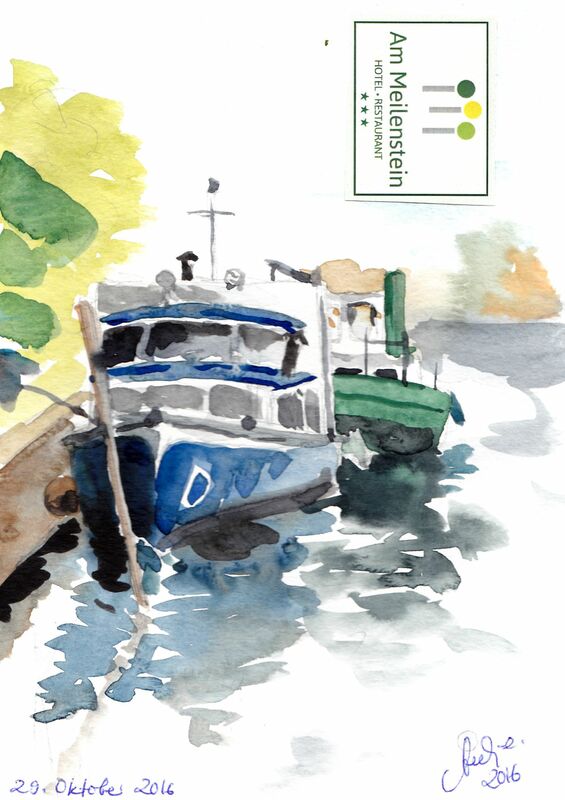 Und noch eins: beim Malen wusste ich nicht, dass das hintere Boot mich und alle Partygäste an diesem Abend über den See und in den Sonnenuntergang schippen würde (und zurück). Ich war richtig glücklich, als mir klar wurde, dass ich auf dem Boot stand, das ich so lange angeschaut hatte.